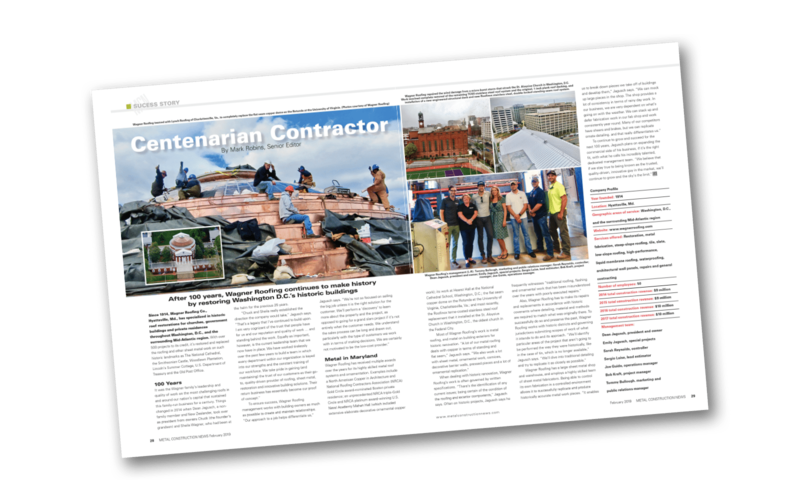 Wagner Roofing was featured in the latest edition of Metal Construction News. Since 1914, Wagner Roofing Co., Hyattsville, Md., has specialized in historic roof restorations for churches, government buildings and private residences throughout Washington, D.C., and the surrounding Mid-Atlantic region. With over 500 projects to its credit, it’s restored and replaced the roofing and other sheet metal work on such historic landmarks as The National Cathedral, the Smithsonian Castle, Woodlawn Plantation, Lincoln’s Summer Cottage, U.S. Department of Treasury and the Old Post Office.